The stunning beaches in Tel Aviv are among the most beautiful in the Mediterranean, and it is a great home base for launching your tour of Israel! 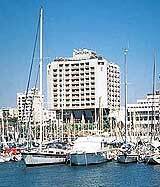 Our list of hotels in Tel Aviv includes the famous Dan Tel Aviv, the Hilton Hotel, the Carlton Hotel, and the David Intercontinental. If you want proximity without the cost, we have budget hotel options as well!